This "People with MS Infographic" was made using a neat tool I found. It shows approximately how many people have MS now. At the rate of being diagnosed at 200 per week or 10,400 per year, the number of people with MS will be around 443,600 by 2020. If the rate of diagnosis remains the same, and this is an estimate according to experts who study MS, that number is pretty close to half a million people with multiple sclerosis. 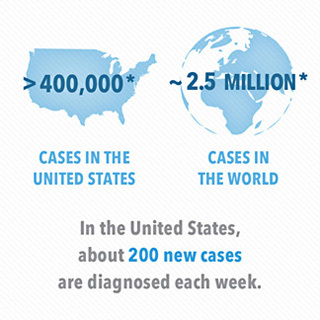 I wonder if it may even be higher with better technology and tools to diagnose the disease earlier. This would be a good thing, especially if people can find out sooner what is wrong and begin treatment earlier. This can include MS medicines that slow down the progression of the disease and alternative treatment methods like a healthier way of living, which is good for all of us, MS or not. Infographics are fun to look at and in ways make things clearer than text or audio. I think everyone likes looking at pictures or graphs. And although the thought of so many people developing MS over the next few years isn't something we want to happen, maybe those with a higher risk will begin taking preventative steps like checking their vitamin D levels. And who knows, maybe a cure will be found in the next few years to bring that number down. Or at least a treatment option that will significantly reduce the progression of the disease so that MSers can have a better quality of life. I am always hopeful that this will be the case. If you arrived here first to our site and would like to find out more about MS, here are a few pages you might be interested in. These are just a few pages to get you started. And of course, you can always check out the blog to find out what's new. If you'd like to see a few more fun graphics that you can use on your site, follow this link from People with MS Infographic.